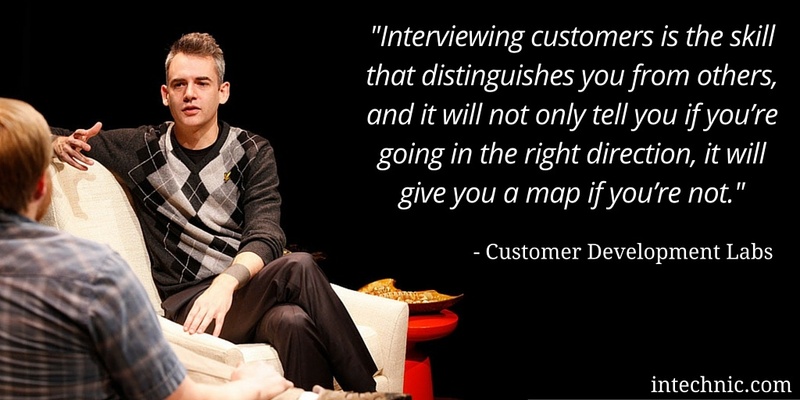 Continued from, "Website User Interviews: How to Interview Customers for Marketing Goals". In my previous article, I introduced you to the 7 steps of our tried and true website user interview process. 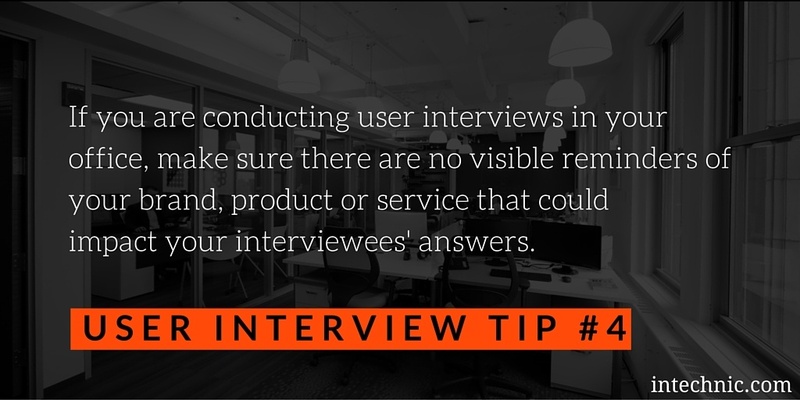 Conducting effective user interviews is both an art and a science. In this article, I share some additional customer interview tips, techniques and resources that I’ve discovered from doing many, many interviews. Despite your best efforts, inevitably, you will have some interview cancellations or no-shows. In fact, the Nielsen Norman Group estimates a no-show rate of about 10.6%. To prepare for these gaps, schedule more than your bare minimum for each user group. 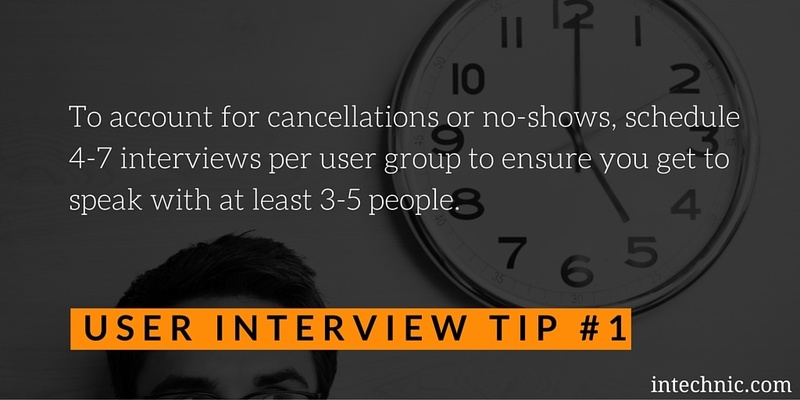 In my last article, I suggested a minimum of 3-5 interviews per user group. Try to schedule at least 4-7. Best case scenario, everyone shows and you have more than enough information to apply to your marketing strategy. Worst case scenario, several interviews cancel, but you still meet the minimum needed to gather usable data. 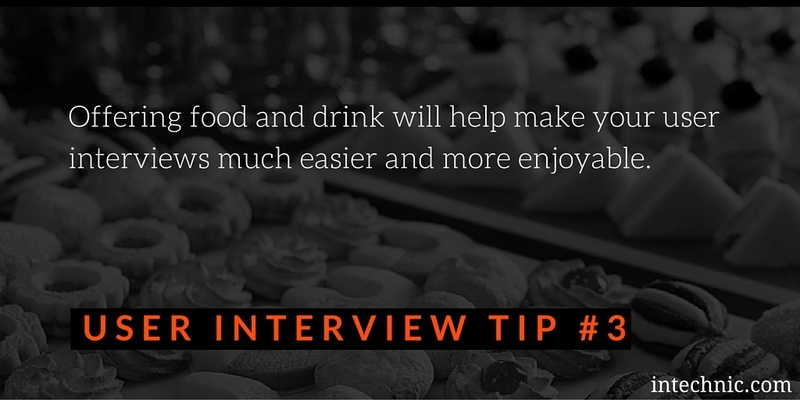 Mentioning that you offer complimentary food and drink can be helpful when encouraging people to attend and participate. At the very least, offer a choice of water, coffee or tea and a light snack. Making these simple items available, which trigger pleasure sensors in the brain, makes conversations easier and much more enjoyable. Since you’ll both be talking quite a bit, take a glass of water or cup of coffee for yourself, as well. This is a big one! Bias can creep into your interviews, despite your best intentions. 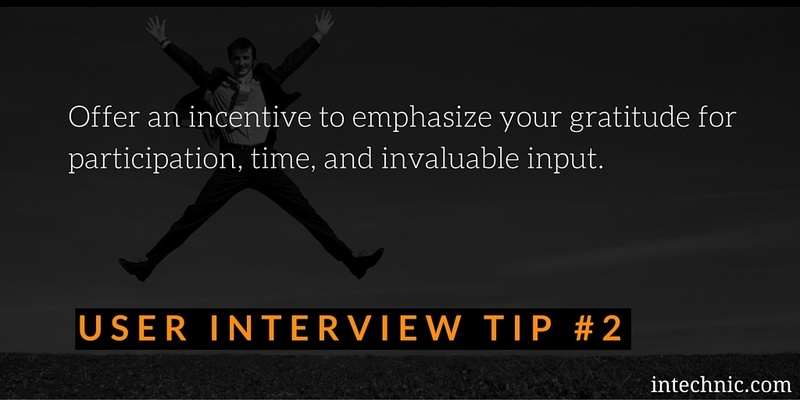 You want to keep your interview results as objective as possible in order to gather usable information. 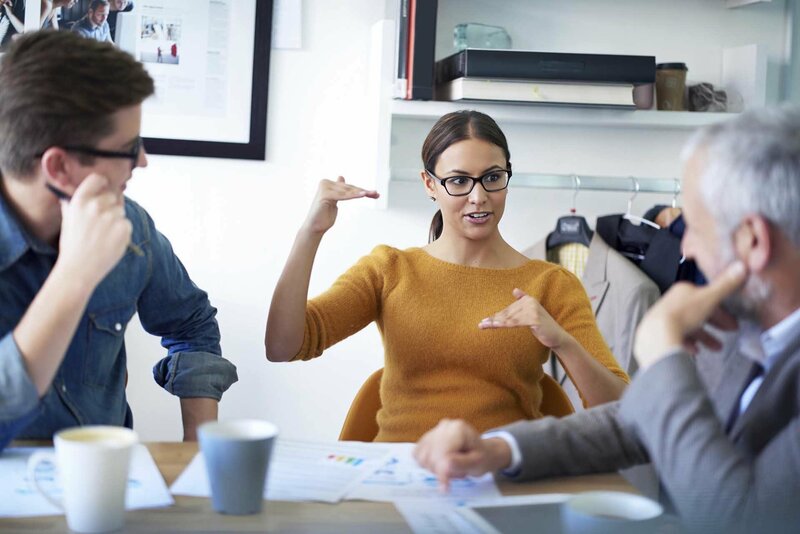 Consider hiring a third party agency to conduct interviews on your behalf. This is the best way to encourage open and honest information from customers who may not feel comfortable sharing with someone from your company. If you decide to do interviews in-house, make sure to conduct your customer interviews in an unbiased environment. Even the presence of company branding can serve as a reminder and unconsciously sway someone’s responses in favor of your company. 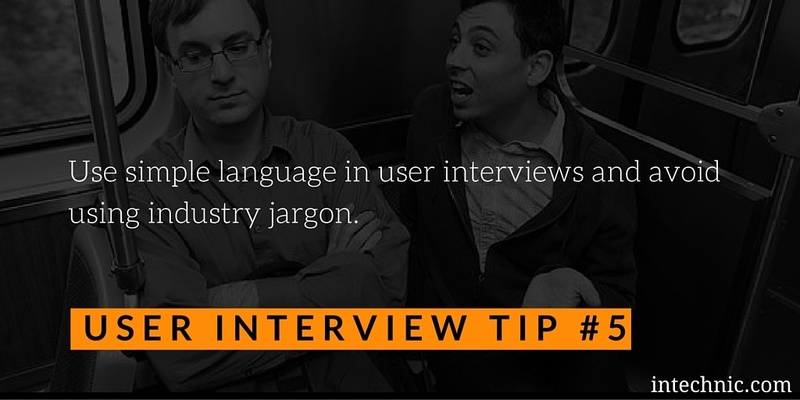 Do not overcomplicate your questions with industry jargon or you’ll lose your interviewee’s attention and interest. Using industry specific terminology during an interview might confuse and ostracize those who aren’t familiar with those terms. Use simple language as though you are having conversation with a friend. Merriam-Webster defines a leading question as, “a question asked in a way that is intended to produce a desired answer.” Using questions such as “Don’t you think this company should get a new logo?” prompts the interviewee to agree or view the logo negatively when, in fact, the opposite may be true. Instead, ask “What is your impression of the logo?” and let them describe their thoughts. Don’t push for answers, avoid personal opinions, and do not attempt to confirm any of your own assumptions. You cannot expect relevant/usable information from someone who is being led or pushed in a certain direction. Don’t try solving anything right away. 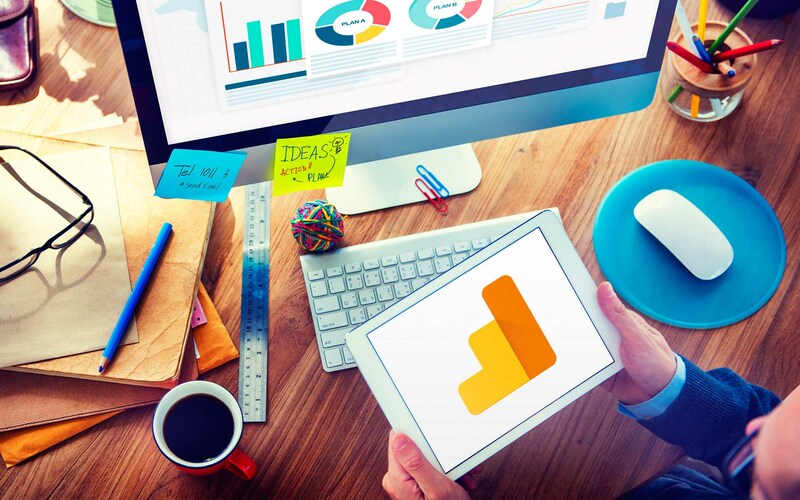 You may already have an idea of what you’d like your marketing strategy to look like. 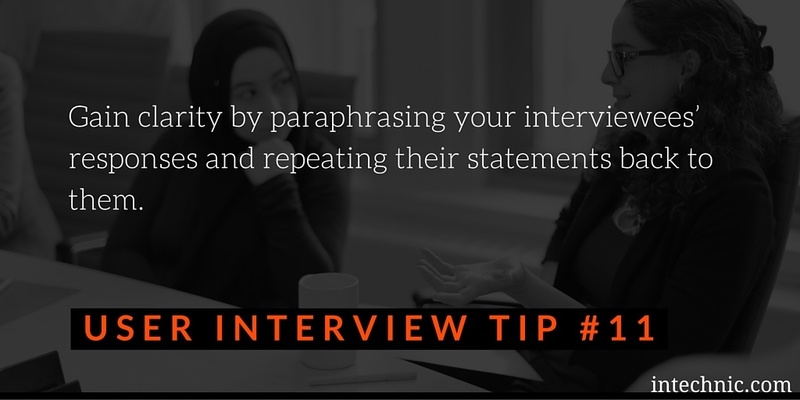 Unconsciously, you will be looking for interviewees to validate your ideas which is likely to come across in your body language, if not in your questions. Bad idea. 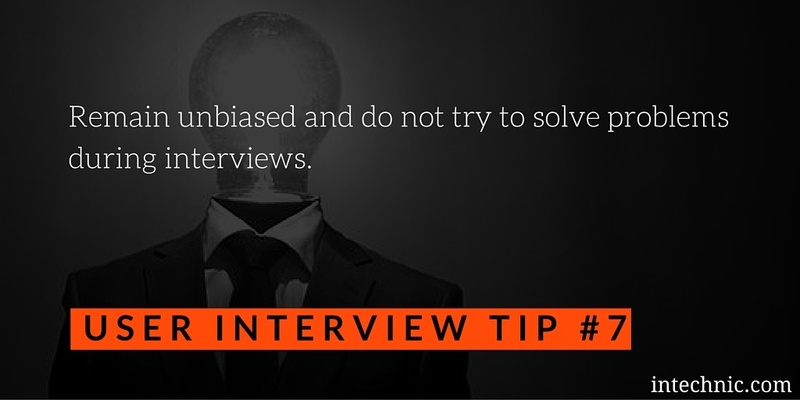 Once again, remaining unbiased is crucial if you want to get true and factual information from your customer interviews. 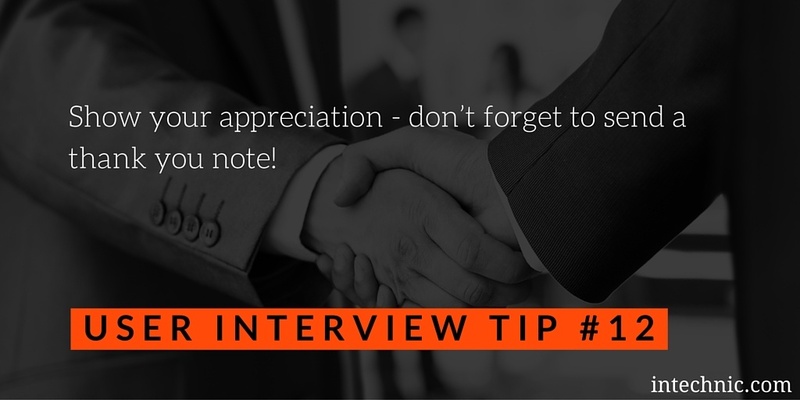 Even if you’re recording your interview, you will want to take additional notes. 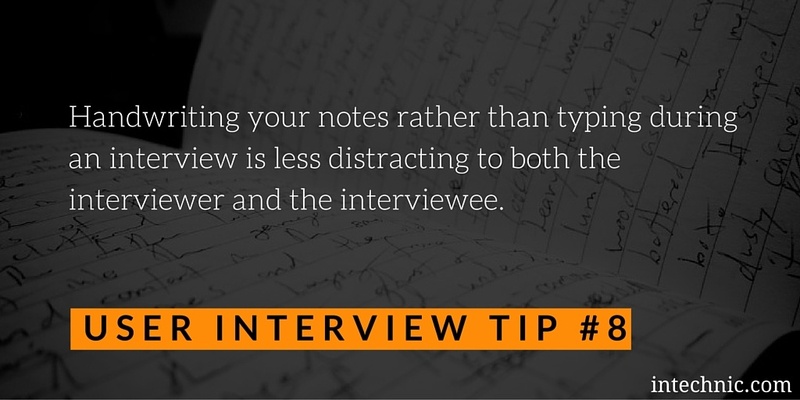 Especially when conducting in-person interviews, don’t type your notes but keep a notepad on hand. Typing is impersonal, noisy and distracting and, therefore, it may alienate your customer. Plus, by staring at a computer, you are missing the opportunity to gauge their reactions. Better to hand write and then transcribe. Even over the phone, try not to let your note taking distract from the conversation. As much as possible, rely on shorthand as long as you feel you can accurately capture the answers. As mentioned in my article about conducting website user interviews, recording user interviews, paying close attention and recording notes on body language and emotions or reactions can gain you valuable insight into your customers – especially things that delight or frustrate them. Often, how someone is acting will tell you a lot more than what they say. You should be able to tell if someone is not saying something which will help you know when to probe deeper or when to leave things alone. If someone is not talking, a good tip I’ve relied on is to let the silence linger, even if that means making things a little awkward. If they are giving a lot of one-word answers or having difficulty finding the right words, be patient. There is no better way to get someone to talk than with some dead air or, in the case of a dead end, the simple use of the word "Why". 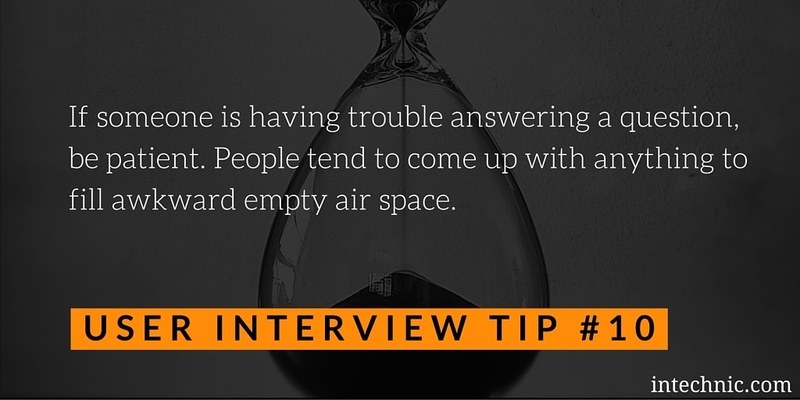 Use reflection tactics to guarantee you’ve understood all of your interviewee’s answers. Reflection is the process of paraphrasing and repeating their statements back to them. These statements are usually preceded by “So in other words…” or “I hear you saying….” Often, this will help eliminate misinterpretations and, as a bonus, may result in additional information as they correct any inadequacies or attempt to explain themselves in a different way. I would like to extend my sincerest thanks for participating in [Company name]’s marketing research. Your feedback will help us improve our marketing strategy immensely, and, eventually, provide you with a more a more pleasant, streamlined user/customer experience. Thank you again for your time and valuable help in our study. This all may seem a bit overwhelming. 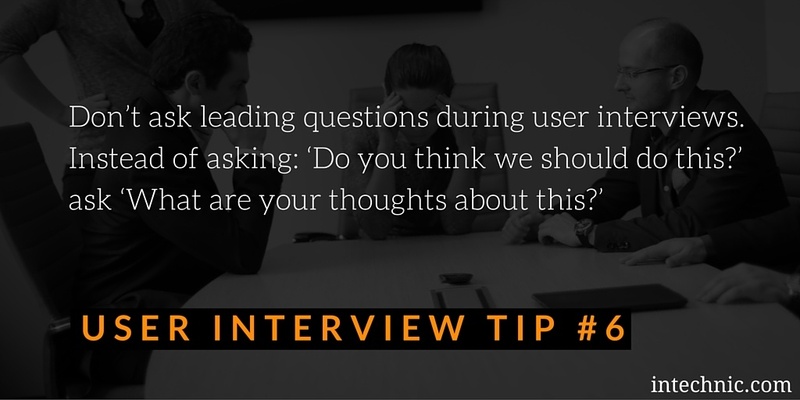 That’s why we have provided the Customer Interview Questions Template that we use here at Intechnic. This tool will guide you through your interview preparation, suggest sample questions and will get you started gathering information straight from those who can help the most – your customers! Once you’ve conducted all interviews, you will need to capture this information and preserve it in a format that is usable for your marketing. 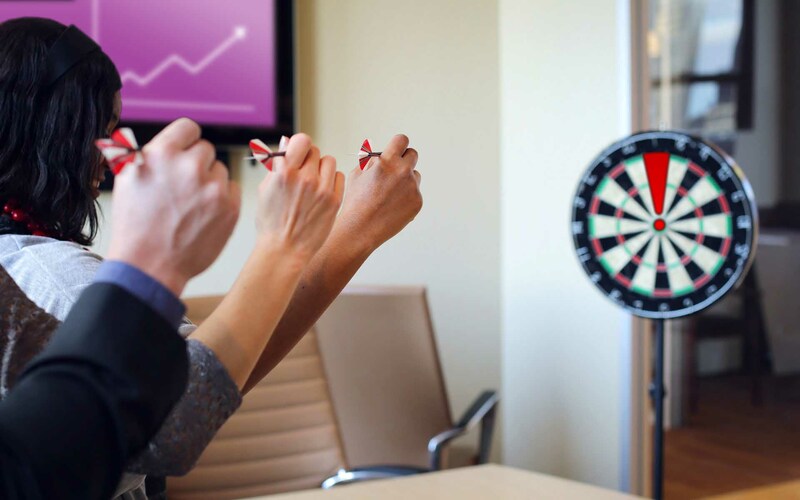 The best way of doing just that is through buyer personas – the next step in the marketing strategy process. 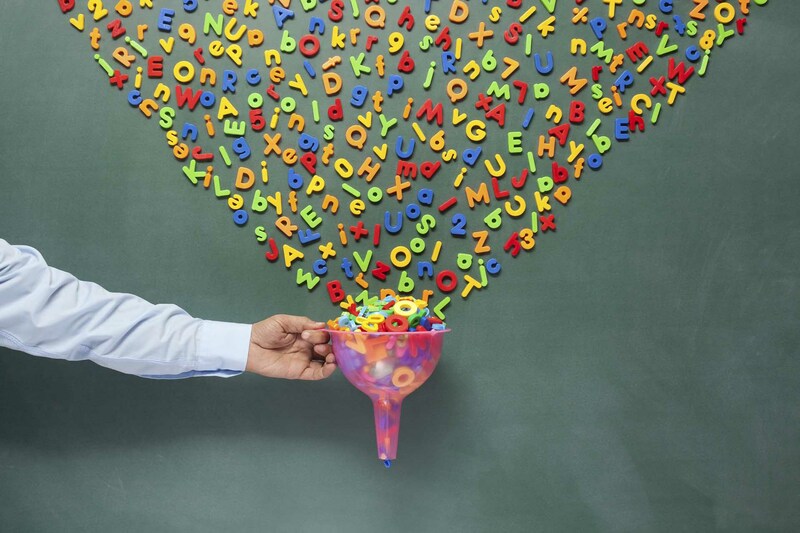 We’ll show you how in the next article, “How to Create Buyer Personas: The Ultimate Marketer’s Guide”.